The nation’s food industry is diverse and complex, but also at risk. 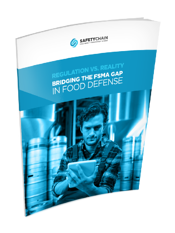 From widely distributed networks and varied operating models to interdependent online and offline functions, business owners, senior management, and operators are faced with the daunting task of managing FSMA regulations alongside the reality of day-to-day operations. This quick read will give you insights on the five goals of food defense and address the steps required to develop a Food Defense Plan, a key component of FSMA.